GET OFF YOUR SOFA ONTO THE HOTTEST DEALS ON TWO WHEELS. 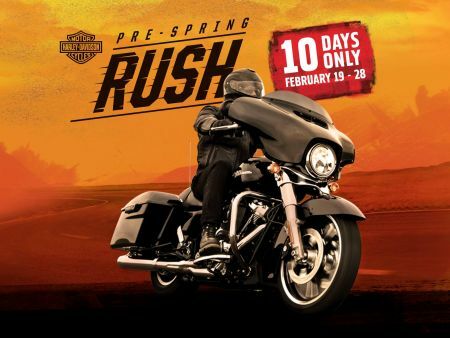 Welcome the start of the new riding season with our Pre-Spring Rush Event. You could ride away with unbeatable deals on our range. Take a Test Ride on any Touring model and receive £1,000 allowance in the form of Trade In Support, Finance Deposit Allowance or for Genuine Accessories / Motorclothes, when purchasing a new MY18 Touring or CVO model. Get £1,500 deposit contribution towards financing an FXDR through HD Finance at only 9.9% APR! This scheme is for Harley|OWN customers on a 25-37 month maximum term and Harley Purchase (HP) set for 25-48 months. Any term on excess of this the FDA will not be paid. The £1,500 is co-funded; with £1,000 from H-D and £500 dealer contribution. Not available in conjunction with any other H-D Promotion i.e. BOTK’s PAM offer. Promotions available to customers financing on Harley|OWN (PCP) / Harley|Purchase (HP) via Harley-Davidson Finance in the UK & Ireland . Motorcycle must be registered by 31st March 2019. Customer will receive Parts, Accessories and General Merchandise to the value stated. The PAM allowance can be spent against genuine Harley-Davidson Parts, Accessories and General Merchandise (excluding labour) at time of motorcycle order.PAM allowance value includes VAT and will be shown on customer’s invoice as a discount. No cash substitutions. The allowance may not be used in conjunction with any other Harley-Davidson offer. These promotions are available in UK & Ireland authorised Harley-Davidson dealerships and is subject to stock availability. Promoter: Harley-Davidson Europe Ltd., 6000 Garsington Road, Oxford OX4 2DQ. Harley, Harley-Davidson and the Bar & Shield logo are among the trademarks owned by H-D U.S.A. LLC, a related company to Promoter.